Is this the ultimate marketing weapon? Considering how many people buy takeaway coffee, it’s odd that marketers haven’t taken advantage of the pervasiveness of the humble takeaway coffee cup for marketing purposes. But this marketing potential did not go unnoticed to the marketers at General Pants for the launch of their flagship store on Bourke Street in Melbourne a couple of years back. It happened that Creative Director Alvin Chia’s favourite cafe was close to the new General Pants store, so he was pleasantly surprised when he popped in for his usual takeaway coffee, to be presented with the specially branded coffee cup below and then informed by the barista that his coffee was free and courtesy of General Pants. 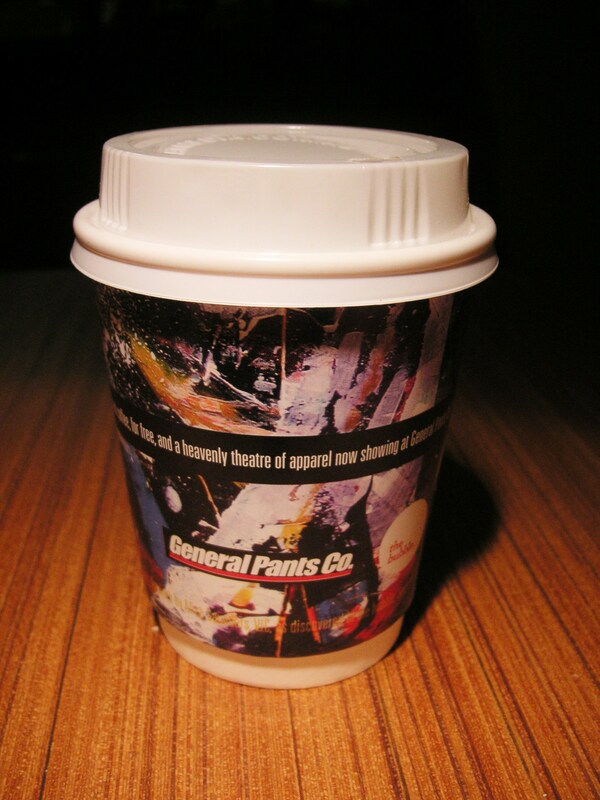 The specially branded takeaway coffee cup by streetwear retailer General Pants: The marketing idea may not be new, but the execution is pure genius. And sure enough, the overall feel-good feeling from the free cuppa, the generosity of General Pants, the personalised delivery of the marketing message from the friendly barista and the pure genius of the marketing idea compelled him to check out the new store. This is one of those marketing ideas that truly elevates the perception of a mundane object to that of marketing holy grail. Imagine the marketing potential of other household or pedestrian objects that people come into contact daily, just waiting to be unleashed. We can’t wait for us to be the next ones to come up with that idea, so someone else will be writing about us on their website too. win-win. i love general pants and i love coffee too. Beyond this coffee idea, General Pants also had an indie band perform in the shop window of the Bourke Street store launch so you can see how their ideas all link to one another, and their success with innovative ideas make them the brand that others want to emulate. It also helps that they’ve got clothes that are as cool as their marketing too.